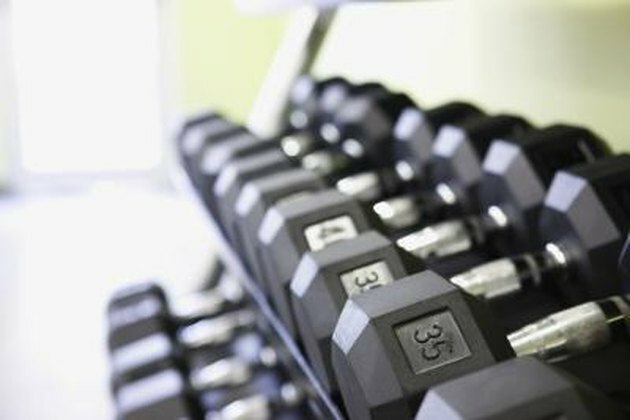 Weight training -- also referred to as strength training -- offers many benefits, including stronger bones, greater strength for sports and everyday activities and increased fat burning due to an elevated metabolic rate. While weight training is generally considered a healthy pursuit, the timing of your workout may affect the safety of your workout. Your hormones can be broadly labeled as either anabolic or catabolic. Anabolic hormones, specifically testosterone and growth hormone, repair and build tissue while catabolic hormones, specifically cortisol and glucogon, cause tissue break down. Anabolic hormone levels are highest later in the day while catabolic hormones tend to be highest early in the morning. This means that, for strength and muscle building, workouts later in the day may be more productive. Eating before your early morning workout can help shift your hormonal balance from catabolism to anabolism. Your joints and muscles are generally immobile while you sleep. This causes muscles to tighten up and production of synovial fluid to decrease. Synovial fluid lubricates your joints to keep them moving freely. In addition, your inter-vertebral discs decompress and absorb more fluid than normal. In their "plumped up" state, your discs are more prone to injury for the first hour or so of the morning. Back expert and author of "Ultimate Back Fitness and Performance" Stuart McGill suggests avoiding all strenuous back exercises such as squats and deadlifts for at least an hour after getting out of bed. McGill recommends a longer warmup for early-morning exercisers. On waking, your blood glucose levels are likely to be low. This is due to the fact you will have been without food for anything up to 12 hours. Exercising with low blood glucose levels can cause temporary hypoglycemia, resulting in waves of nausea, weakness and feeling faint. In most cases, this will mean you will have to stop your workout. Hypoglycemia is much less likely to occur later in the day because you will have probably eaten two or three times before hitting the gym. Pre-exercise feeding is an important consideration if you are going to exercise in the morning. There are some solutions that can be employed to make working out first thing in the morning safer and more effective. Perform a longer warmup than usual and focus on mobilizing your major joints and spine. Continue your warmup by doing progressively heavier warmup sets and build up to your maximum weights gradually. If you notice that any of your joints feel stiff in the initial stages of your workout, spend extra time warming up these areas and only increase the intensity of your workout once you feel absolutely ready. Make sure that you consume a pre-workout protein- and carbohydrate-rich meal or drink to ensure that your blood glucose levels will not drop during your workout and to promote the switch from catabolism to anabolism. Sports Injuries: Their Prevention and Treatment, Third Edition; Lars Peterson, et al. What Are the Benefits of Lifting Weights at Night?